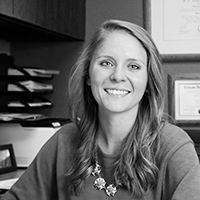 As a genetic counselor at Perinatal Associates of New Mexico, my role is to guide and support patients through pregnancies at risk for genetic disorders. I help patients understand how family and pregnancy history may impact the chance of these conditions occurring. It is my goal that every patient leaves my office able to make an informed decision about genetic testing. My interest in genetics grew from a young age and stayed with me while attending the University of Texas in Austin. From there I went to graduate school at the University of Texas Health Science Center in Houston and received my genetic counseling training in the incredible Texas Medical Center. I am excited to be a part of the PANM team and am enjoying everything Albuquerque has to offer. In my free time you can find me hiking, eating chile, and playing with my puppy.